I have been reading up on what flavours are available to be found in whisky. Seems there are loads of charts to be found. One chart I like is the one made by Dave Broom, author of the atlas of world whisky. I can not put his chart up in this blog since he has the copyright of it and you will just have to buy his iBook or Book online. There is highly detailed information there to be found and it uses the information already available in studies and puts it in a flavour map. The information presented in this map chart is characterised by similar flavour camps that Dave Broom also uses in his writings. 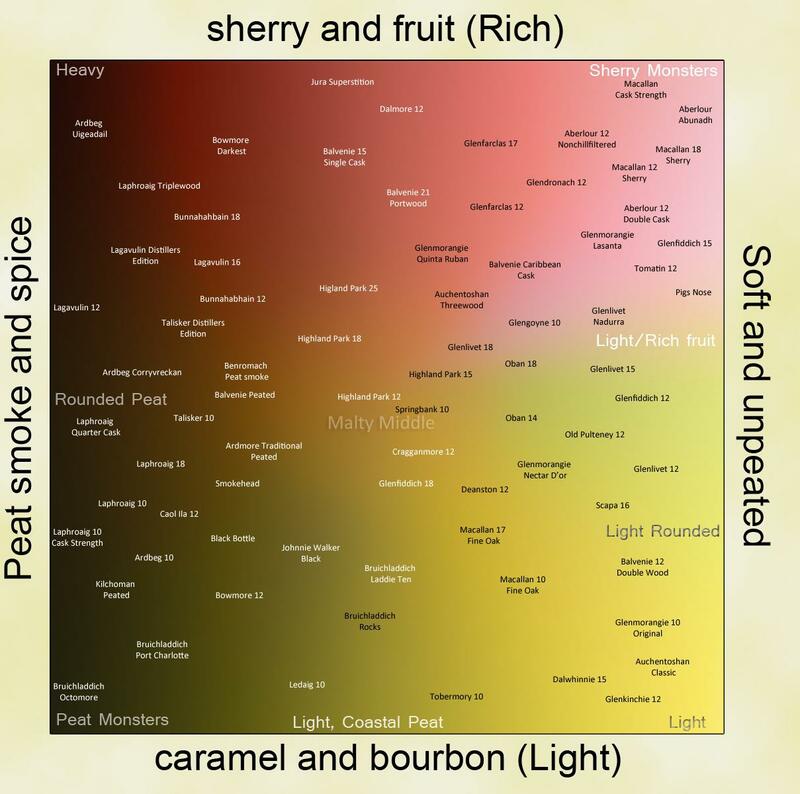 I find both flavour maps highly informative and helping me identify where the whisky I like is placed in these charts. Will that mean I will not like a whisky that is situated on the other end of a spectrum? It may, but when I am after a similar taste experience to a whisky I know I may look at these charts and find a close neighbour. Another chart I located online also puts port/whine/sherry influences in a chart. This help because it shows the influence of sherry and other wine casks on the flavour profile of a whisky. From the Dave Broom diagram is is not clear to me if I would be buying a sherry matured whisky or not. This is not a big issue since you will probably be able to read information on the label that would help in this respect. Also blogs, reviews can help. I however like this char since it helps spot the sherry tasting whisky I don’t like at this point in time. Is there a universal truth? No! Why do I say this? A chart like the ones above may be true on some level, but it will never have the detail to match up with your own personal flavour preferences. Therefor I advice to use these charts for what they are and let your senses make the choice if you like a dram or not. In 2001 a Flavour Wheel was suggested by Lee et al. in the Journal of the institute of brewing. I have bee using this one ever since and I have been using it for all my tasting notes. 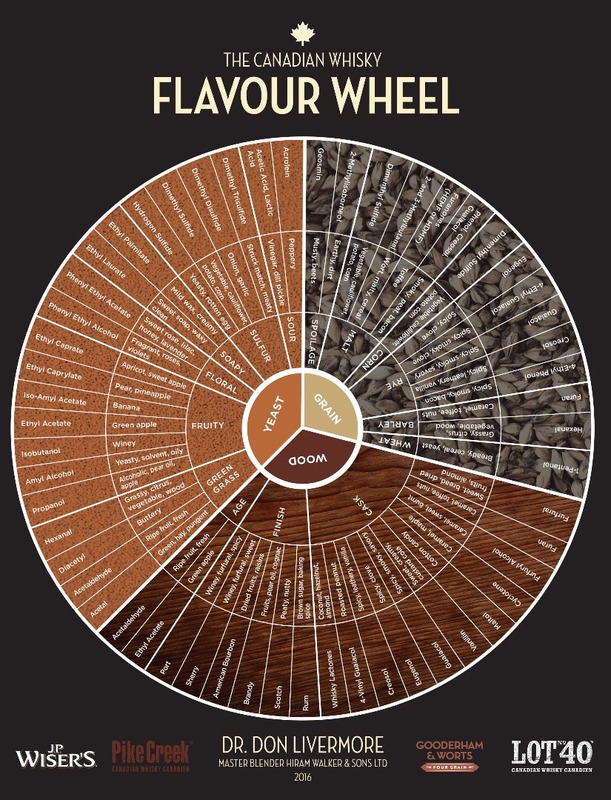 I also started a page describing all the flavours and aroma’s that are on the wheel.